Just days before wrapping up their US tour with Set Your Goals, Alter The Press! sat down with Kyle Profeta of Comeback Kid to talk about their forthcoming new album 'Symptoms and Cures', recently signing to Distort Records in Canada, being on this year's Never Say Die! European Tour and more. Alter The Press: How has the Set Your Goals tour been going so far? Kyle Profeta (drums): Amazing, the package has been so strong. I think bands like Title Fight, and the other openers, have brought a lot of hype to the tour; the numbers have been great. It's been a lot of fun. We've gotten to get to know the Set Your Goals guys really well; we've known them in the past, but not really spent a lot of time with them. It's nice to have some new friends in the mix, like meeting all the Title Fight guys; this tour has been all smiles and a lot of fun. ATP: How did you hook up Set Your Goals? Kyle: That's funny, because about a week ago, we agreed on the album name and just started calling it that; so that's how fresh it is! It's now been announced and we're sticking with it! 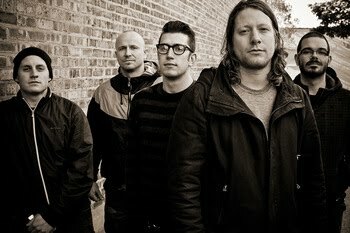 ATP: What can we expect from the new album? Kyle: We always get asked this question, and we always give the same sort of answer, but, in my opinion, it's our best album. We really found our mesh with Andrew (Neufeld) singing, that was the change. 'Broadcasting' (last album) was a ‘feeler,’ us getting in the mode of Andrew becoming our front man. I feel these songs have found our sound with him and we're really excited. Today we actually got some rough mixes, and we're pretty stoked about it. ATP: So it's a step in a different direction? Kyle: Completely different; but it's still us. It's not as dark and it's a lot more positive. The songs in general are a lot more fun in to play, they stick in your head a little more. I'm not saying it's a pop-punk record, but it's definitely not as dark as 'Broadcasting' was. ATP: Have you narrowed down the songs for the album? Kyle: Yes, there will be eleven songs on the record. We recorded eleven, all of them are solid, there's no filler and they are all making it to the record. ATP: Do you have a tentative release date? Kyle: We're looking to release it in late August/early September; we're going to hit the road then, tour Canada, US, Europe, then see how it works. ATP: You recently signed to Distort Records in Canada. Kyle: We did, we're extremely excited about that. We met Greg (Below, Distort Records founder) while we were recording in Toronto and we're really stoked about it. ATP: How did the deal come about? Kyle: What happened was, Smallman, who we were on, were shutting down, moving onto big and better things. Greg then approached us and we were stoked about it. Cancer Bats are on the label too, and are good friends of ours, and spoke nothing but great things about them. We are really excited about it. ATP: It just got announced the other day; you’re the main support on this year's European Never Say Die! Tour. Kyle: Yes, I was looking at that the other day, those are some big rooms. We're really excited about that, especially for Europe, because we've only had a couple of supports out there. It'll be good to do a support for a different audience, because, obviously, Parkway Drive is going to draw a lot of metal kids. I'm looking forward to it, we love Europe and we love beer. We're really stoked about it. ATP: What's planned after this tour has wrapped up? Kyle: We are doing the 40-hour drive, from San Francisco to Winnipeg, and then home for about a week. Then we fly to Toronto, mix the record, and then come home. We are taking the majority of the summer off, we have the odd thing planned for August, but for June and July, we're at home. ATP: It's funny because the album isn't even done yet and you've been out on the road since the beginning of the year. Kyle: We originally planned to have it mixed before we left, but that's how it works when you're in the studio, you just follow the creative flow I guess, and see how it goes. ATP: Have you been previewing new songs live yet? Kyle: Yes, we've been playing one song; it's actually going to be the single. It's called 'Because Of All'. We've been getting a grasp for it live. Obviously kids don't know it yet, so there's not some crazy Comeback Kid reaction, but I think everyone is digging I; we're excited about it and it's a lot of fun. ATP: Will this be the last album you'll be releasing on Victory Records? Kyle: We were given three albums, and an option which is up to them. It's our third record, so it's up to Victory to see how well this one does, and see if they want to keep pushing us.